Dr. SL Chan is a leading Singapore Dental Surgeon specializing in Oral Maxillofacial Surgery. He graduated from the National University of Singapore with a Bachelor of Dental Surgery (BDS) in 1989. He obtained his training in Oral and Maxillofacial Surgery under Professor H. Tideman in the University in Hong Kong, where he graduated with a Master of Dental Surgery in Oral and Maxillofacial Surgery. Subsequently, he was admitted as a Fellow of the Royal Australasian College of Dental Surgeons as well a Fellow of the Academy of Medicine, Singapore. Dr Chan has held major leadership position in Singapore Dentistry, including being President of the Association of Oral and Maxillofacial Surgeons (Singapore), Chairman of the Singapore Regional Committee of the Royal Australasian College of Dental Surgeons and Chairman of the Chapter of Dental Surgeons of the Academy of Medicine, Singapore. 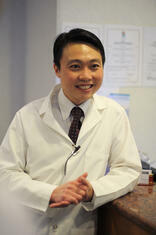 Since 2006, he has been appointed as a member of the Singapore Dental Council. Dr Chan’s practices a broad scope of Oral and Maxillofacial Surgery, with a special interest in reconstructive jaw surgery for dental implantology as well as corrective jaw surgery for dento-facial disharmonies. He teaches and lectures internationally and is devoted to the advancement of Oral and Maxillofacial Surgery. In addition to his private practice, Dr Chan teaches part time in the Department of Oral and Maxillofacial Surgery, National University of Singapore.